Wow, this doesn't tell you much, does it? "Road Ends Approx. 2 miles." This is the entrance to San Juan CR 18. First, I took the fork to the right. It ends at an old mining site (B) that overlooks the Mineral Point area. The road used to go down to Mineral Point, but the BLM has blocked it so that it won’t be a through route. So I backtracked and headed down to Mining Site A where, to my pleasure, I found a remarkably intact old boiler and steam winch, the picture of which is at the top of this post. Let’s look at the boiler. There are three parts: the firebox, the boiler, and the smoke box. 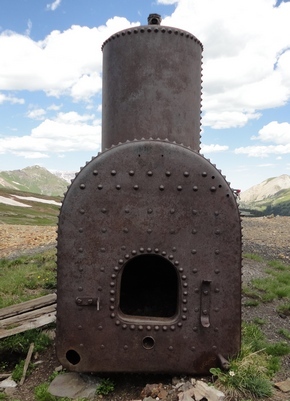 First, the firebox, the opening to which you see in the photo to the left. If it looks like the place you throw coal or wood on a steam locomotive, you’re right—same concept. The door would have had its hinges on the right and the latch on the left. It’s into this area that the fireman throws the stuff to be burned. The heat of the fire is controlled by how much air the door lets through. The fire burns in such a way that the smoke (and heat) is drawn through the tubes. 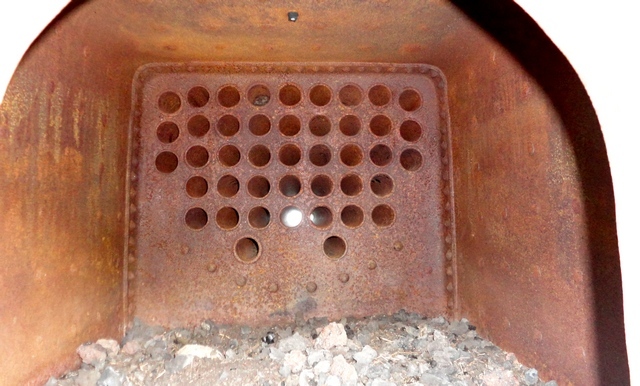 You can see the tubes in the picture below, which is taken inside the firebox itself and looks through the boiler tubes. Note that the purpose of the steam dome is so the steam can be drawn off without a bunch of water getting mixed in. Inside the firebox. This is the combustion area. The smoke and heat goes into those tubes. The smoke and heat goes through the tubes, which run the length of the boiler. So, the boiler does not sit atop the fire, but rather beside it! At the far end there’s a smoke box. The smoke box is simply that—a box (in this case circular) with a smokestack at the top. In the photo at the top of this post the end cap of the smoke box is missing. So, air comes into the firebox where the fuel burns. (I point out that this site is well above tree line, so every stick of wood had to be cut at lower elevations and hauled to the site, not an easy job!) The hot gasses travel through the tubes into the smoke box, from where they go up the chimney. Great, you say, but how does it develop a draft? That’s the secret of course, but it works the same way as in a steam locomotive. Get the fire going and the hot gasses will seek a way out. Once they start going up the smoke stack, you’ve got a draft. On steam locomotives, used steam is injected into the smoke box to help with the draft, which is why you see them “puffing.” What’s puffing is actually the steam—the fire burns steadily. I saw no evidence at this site that used steam was channeled back into the smoke box. Okay, so that brings us to what the steam was there for: the winch. The winch is right next to the boiler. Actually, it would better to say that the boiler is right next to the winch, because the winch is where it needs to be to haul ore and people up and down the shaft. The parts are labeled on the photo. You can see where the steam came in, a piston on each side, the crank and the reduction gear drive. This remarkably-complete winch even has its original brakes. The photo below shows one of the pistons (at the right) and the rod. Piston on steam winch. Note that the bearing cap for the winch's drum is missing on this side. Writing atop piston. "Mine & (something) Supply Co. Denver & Salt Lake City"
The text says “Mine & [something—can’t make it out—suggestions?] Supply Co, Denver & Salt Lake City.” Supplying the mines with heavy equipment like this was once a big business, as every mine needed this sort of equipment. Now, let’s go to the last photograph before we get to the GPS map. This photograph is probably the most fascinating of the lot, because it shows how intact this antique piece of equipment is. 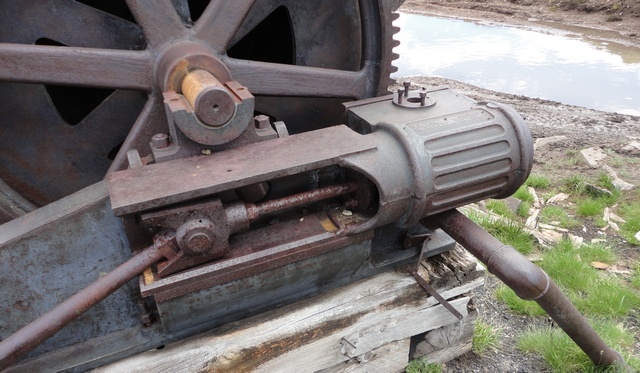 Winch detail showing the other piston, the other drum bearing, and the still-intact wood brake shoes. In the picture you can see several things. The one that blew me away is that the wood “shoes” in the brake are still intact! The brake was applied by tightening the band that held the shoes so that they would clamp onto the rotating drum. 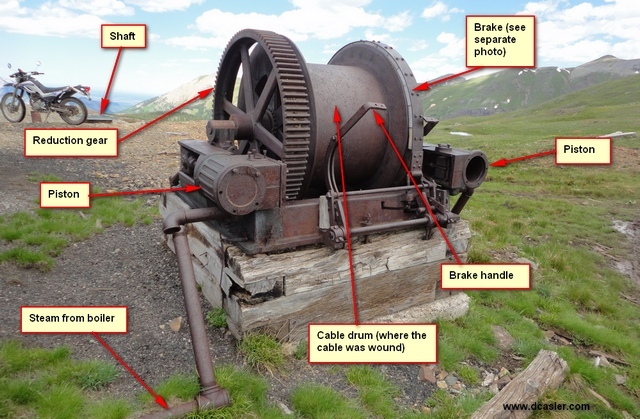 The reason the brakes are so essential is because the winch has no counterweight, so these brakes would have to be able to hold the bucket, down in the mine, steady while it was loaded with ore or overburden. A big bucket of ore is heavy—tons! It would take two full-time men to handle this system: one to tend the boiler and one to tend the winch. Inattention by either would result in disaster! But although this technology is old (from the late 1800s), it certainly worked. And the iron in these machines has far outlasted the wood structures at the site, all of which are now gone. Below you’ll find the GPS map, including the exact coordinates where the road starts so you can find it easily. Map showing San Juan CR 18. Mining Site A is the interesting one. 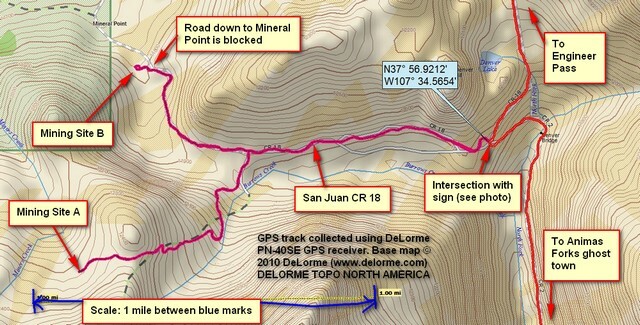 The inset gives the coordinates of the intersection of the Engineer Pass Road with the San Juan CR 18 side road. Okay, okay, so this post is pretty technical. I don’t do this often, so give me this one. I am, after all, an engineer by profession. This entry was posted in GPS Tracks, Motorcycling, San Juan County and tagged steam boiler, steam winch. Bookmark the permalink. allow the piston to run continuously while the drum was stopped? Dave, For some reason the winch detail photo is not visible (box in corner with X).